Catherine Daniel (Erda) and Ryan McKinny (Wotan) in L’Opéra de Montréal’s Das Rheingold. Photo: Yves Renaud. 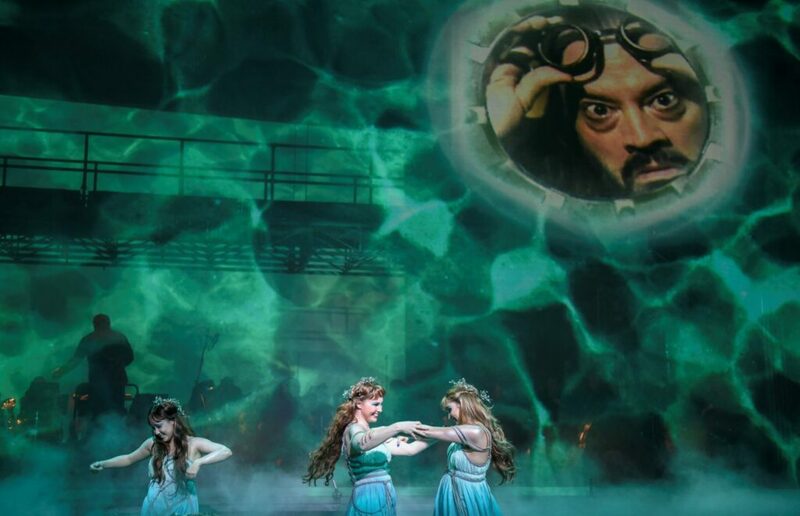 As the most compact of the Ring operas —clocking in at a trifling two-and-a-half hours— Das Rheingold can let smaller companies dip a toe into Wagner’s Nibelungen universe without committing to the scale and expense of the other works in the cycle. A case in point is L’Opéra de Montréal’s production, which opened Nov. 10 as, somewhat incredibly, the city’s first-ever staged Rheingold (a concert version in 2000 marked the company’s 20th anniversary). 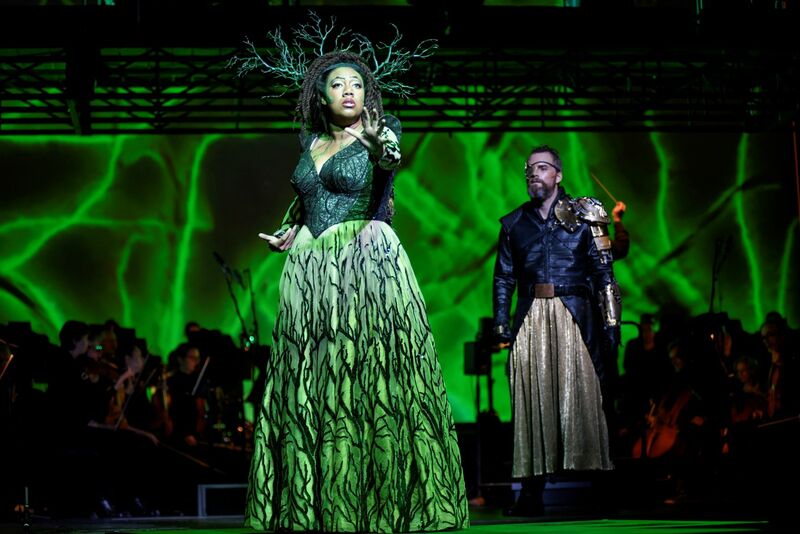 L’OdeM has brought in Brian Staufenbiel’s 2016 Minnesota Opera Rheingold production. His vision borrows liberally from steampunk—all goggles and gears—and uses David Murakami’s clever, animated projections of water, caverns, flickering circuit boards, and a mist-shrouded, Gothic Revival Valhalla to suggest a world where science and nature are at war. It’s an imaginative, effective concept, but aesthetically it pinballs between Tolkien and Jules Verne, like someone spliced random scenes from Thor: Ragnarok into City of Lost Children. There have been worse mashups in the Ring’s history. 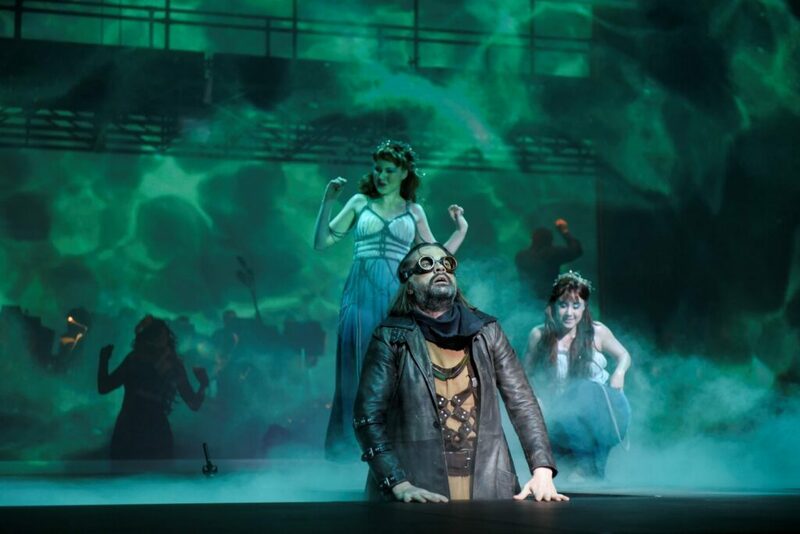 Andrea Nunez (Woglinde),Carolyn Sproule (Flosshilde) and FlorenceBourget (Wellgunde) in L’Opéra de Montréal’s Das Rheingold. Photo: Yves Renaud. Just like the Ordway Center in Saint Paul, MN, the pit at Salle Wilfrid-Pelletier is too snug for the Ring’s XXL orchestra, so Montréal adopted Staufenbiel’s solution of placing the musicians on stage. The Valhalla scenes take place along a suspended catwalk, while the pit itself serves both as the Rhinemaidens’ watery playground and the Nibelheim mines. While this maximizes the available area, I found the transitions between spaces and levels awkward, with performers walking through the orchestra, or popping in and out of the pit in a game of whack-a-mole. With conductor Michael Christie either behind or below them for the entire performance, the singers also have to rely on a video screen at the back of the hall to see his beat. Making his OdeM debut, the eminent Canadian bass-baritone Nathan Berg reprises his Minnesota Opera turn as Alberich. Berg is formidable in the role: twisted, pathetic, covetous, seething with destructive, incel rage. Also impressive was Canadian Roger Honeywell as the trickster Loge. Honeywell’s steely tenor has tremendous dramatic range, nuance and stamina. Although his instrument did not always have enough sheer Heldentenor heft to cut through the orchestra, the top is clarion and secure, while the bottom has a rich, almost baritone timbre. Honeywell is also a professional Shakespearean actor, and his fantastically detailed physical characterization—mincing, obsequious, cunning, moving with balletic grace—made for an exceptionally charismatic, refined Loge. Any Ring production relies on a stellar Wotan. Unfortunately, American bass-baritone Ryan McKinny was underwhelming. Yes, he’s tall, good-looking, and knows a trick or two with a spear, but the voice has no depth, power, or inherent majesty, and the expression felt flat and detached. 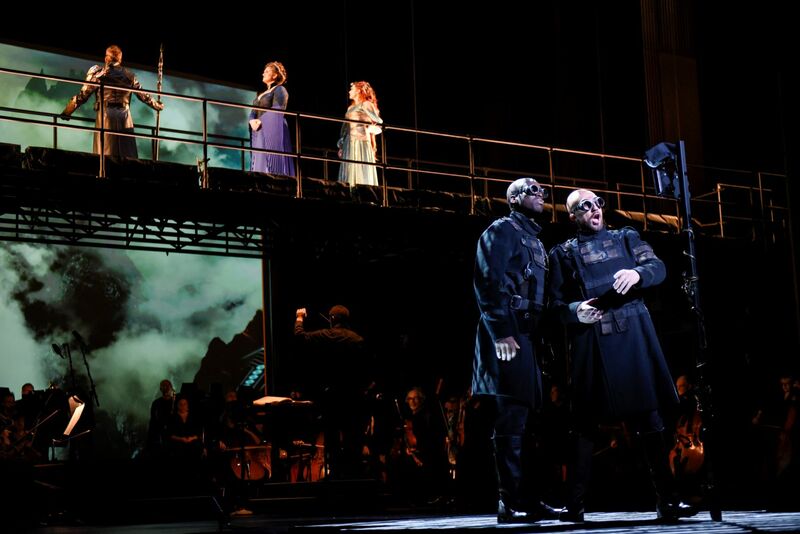 Roger Honeywell (Loge) and Ryan McKinny (Wotan) in L’Opéra de Montréal’s Das Rheingold. Photo: Yves Renaud. Bass Solomon Howard, another American, should have been Wotan. Instead, he gave us a vivid, deliciously terrifying Fafner. Howard uses his imposing physique well, but it’s the voice that grabs you: earth-shaking, enormous, but with ample, deep colour, beautiful tone, and sensitivity to the foreshadowing in the text. As Fasolt, British bass Julian Close produced plenty of volume, but his extremely fast, almost bleating vibrato made his German nearly unintelligible. Mezzo-soprano Aidan Ferguson was a jealous, anxious Fricka. Soprano Caroline Bleau’s Freia was correct, if a little lightweight and vocally indistinct. But it was mezzo Catherine Daniel’s queenly, wise Erda who won the goddess prize. Her spectacular costume—she was crowned with a tall, glittering green headdress of twining branches—didn’t hurt. 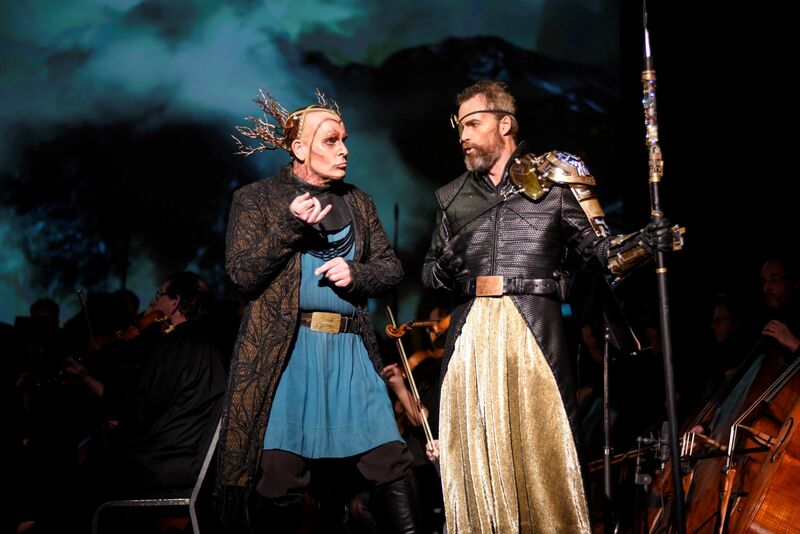 Soloman Howard (Fafner) and Julian Close (Fasolt) in L’Opéra de Montréal’s Das Rheingold. Photo: Yves Renaud. Looking like an alien insect in his wonderfully eccentric costume, American tenor David Cangelosi was a scene-stealing Mime, craven and whining. The three Canadian Rhinemaidens—soprano Andrea Núñez and mezzos Florence Bourget and Carolyn Sproule—were prettily matched, the trio singing finely balanced and laser-cut. Christie favours brisk, muscular tempi and constant impulsion, but I longed for him to create a little more breathing space. As just one example, the build and climax of Alberich’s transformation into a serpent felt rushed through; there was no time for Wagner’s sinuous orchestration to sink in. Das Rheingold continues at L’Opéra de Montréal November 13, 15 and 17. Interesting review, but just one clarification. This may have been the company’s first-ever staged Das Rheingold, but not the city’s. The Thomas Quinlan touring company staged a complete Ring cycle in Montreal in 1914.